Kind Bars are loaded with fat - but are they unhealthy? 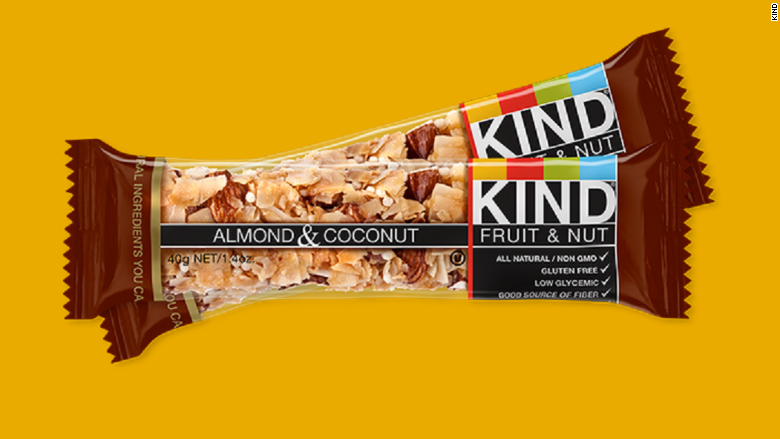 Kind says its snack bars are healthy, despite the FDA's warning letter requiring the bars to remove their 'healthy' labels. The FDA wants the fatty Kind Bars to stop pretending they're healthy. But Kind says the fat in its bars is healthy. In a response to a scathing warning letter from the FDA made public this week, the maker of Kind Bars says it is working to correct its mislabeled products that contain the words "healthy," "plus," "no trans fats," "antioxidant-rich," and "good source of fiber." Kind admitted that its labels did not meet the FDA's standards. But the company also contested the the agency's narrow definition of "healthy." Kind noted that the key ingredient in its snack bars is nuts -- a naturally fatty food that nutritionists believe is nevertheless good for you. "Nuts ... contain nutritious fats that exceed the amount allowed under the FDA's standard," the company said in a blog post. "This is similar to other foods that do not meet the standard for use of the term healthy, but are generally considered to be good for you like avocados, salmon and eggs." Nuts are high in nutritious unsaturated fats, which, when eaten instead of refined carbohydrates and sugar, can lower cholesterol and the risk of heart disease, according to the Harvard School of Public Health. At the same time, nuts are also high in the less-nutritious saturated variety of fat. The FDA requires that for a food item to be labeled "healthy," it must contain less than 1 gram of saturated fat per serving. Four varieties of Kind Bars, including Fruit & Nut Almond & Apricot, Almond & Coconut, Dark Chocolate Cherry Cashew + Antioxidants and the Peanut Butter Dark Chocolate + Protein bar contain more than 2.5 grams of saturated fat, despite being labeled "healthy." In its warning letter, the FDA also knocked Kind Bars for using the terms "plus" and "antioxidant-rich" when they do not contain enough nutrients to satisfy those labels. The FDA took issue with Kind using terms like "good source of fiber" and "no trans fats," because they imply that the bars are healthy. Even if those claims are true, which they are, Kind is not allowed to put those lables on its bars without qualifying that the bars are high in fat. Kind Bars were also reprimanded for putting a P.O. Box on its labels instead of a physical address. Companies can only do that if they are listed in the phone book. The violations are "significant," according to the FDA. If Kind doesn't comply with the changes, the FDA could take them off store shelves. Kind said it is working with the FDA and "moving quickly to comply with its request." The company also said that it is reviewing all of its labels -- even those that aren't subject to the FDA's warning letter. But Kind has no plans to change its ingredients. "We couldn't be more proud of our snack foods and their nutritional benefits," the company said. "While we make these updates to our packaging and our website, please know that our recipes will stay the same."